An alternative to ORM's such as Entity Framework, CodexMicroORM offers light-weight database mapping to your existing CLR objects with minimal effort. Code generation support available. An alternative to ORM's such as Entity Framework, offers database mapping for your existing CLR objects with minimal effort. CodexMicroORM excels at performance and flexibility as we explain further below. Product not a fit for you? Feel free to visit and learn about data integration and ORM concepts through our blog and product updates. Refer to our recent article that covers recent updates in the 0.5 release. Why build a new ORM framework? After all, Entity Framework, nHibernate and plenty of others exist and are mature. I have seen complaints expressed by many, though: they can be "heavy," "bloated" and as much as we'd like them to be "unobtrusive" - sometimes they are. The demo project and tests show several other non-trivial use cases. The work done with CodexMicroORM leads naturally into some related tool work, including a HybirdSQL database add-on, where the goal is to remove the need to worry about object-relational mapping: as an object-oriented database, it will offer excellent in-memory performance with greater simplicity than many other alternatives. Follow this project to stay on top of details! Entities do not need to have any special "database-centric" properties (if they don't want - many will want them). In our example model, note that Phone doesn't have a PhoneID as one example. Entities should be able to carry "extra" details that come from the database (aka "extended properties") - but these should be "non-obtrusive" against the bare POCO objects being used. Entities can be nested in what would be considered a normal object model (e.g. "IList<Person> Children" as a property on Person vs. a nullable ParentID which is a database/storage concept - but the DB way should be supported too!). Use convention-based approaches - but codify these conventions as global settings that describe how you prefer to work (e.g. do you not care about saving a "Last Updated By" field on records? The framework should support it, but you should be able to opt out with one line of code at startup). Entities can be code-gened from databases, but is not required at all. Code-gen properties by entity / database object should be retrievable from a logical model (e.g. Erwin document), SQL-Hero (repository supports flexible user-defined properties), or some other type of file-based storage. Entities shouldn't have to be contained by "contexts" like you see in EF: they really can be any object graph you like! This might seem like a small deal, but it really frees you up to work with objects however you like, with some conventions-based rules. Can be used as a "bridge": you may have POCO objects that don't implement INotifyPropertyChanged for example (and have no desire to change this! ), but you might like this feature with minimal effort in some settings - you could with CEF create dynamic objects that deliver value-add and effectively wrap select POCO objects and use them for specific/limited situations (e.g. UI binding). Anything beyond simple POCO is considered a service. Defaults can be set globally at AppDomain level. Defaults can be set per entity based on code, or using attributes. Defaults can be overridden, per instance, both opting in and out of services. Not every object needs every service, support the minimum overhead solution as much as possible. A "collection container of entities" should exist and provide an observable, concrete common generic framework collection; it's EntitySet<T> and implements IEnumerable<T>, ICollection<T> and IList<T>. UI data-binding support (e.g. implements INotifyPropertyChanged, IDataErrorInfo, etc.) for entities and collections of entities. Caching (ability to plug in to really any kind of caching scheme - I like my existing DB-backed in-memory object cache but plenty of others) - again, caching is a service, how you cache can be based on a provider model. Also, caching needs can vary by object (e.g. static tables you might cache for much longer than others). Key management (manages concept of identity, uniqueness, key generation (SEQUENCE / IDENTITY / Guids), surrogate keys, cascading operations, etc.). In-memory indexing, sorting, filtering (LINQ to Objects is a given, but this is a way to make that more efficient especially when dealing with large objects). Validations (rather than decorate the POCO with these, keep them separate - perhaps some validations are UI-centric, others are not; leave it to the framework user to decide how much or little they want). Extended properties: for example, being able to retrieve from a procedure that returns extra details not strictly part of the object - useful for binding and ultimately may match a saveable object (i.e. not a completely generic bag). Ideally strong-type these additional fields for intellisense, performance, type safety, effective DB contract, etc. These by being kept separate and managed via a service means it's completely opt-in and we don't carry unneeded baggage. This is different from the ability to load sets of existing objects (e.g. Person) from arbitrary procedures as well: if the result set matches the shape of the object, that should just work out of the box with no special effort. Audit - manages "last updated" fields, logical deletion, etc. Things like Last Updated fields should have framework support so we don't have to worry about managing these beyond high level settings. Supports stored procedure mapping such that can leverage existing SQL audit templates that do a good job of building a CRUD layer, optimistic concurrency and temporal tables "done right" (i.e. determine who deleted a record!! - not something you can do natively with SQL2016 temporal tables). Supports parameter mapping such that can still read and write from objects that are strictly "proc-based", where needed. (I.e. having tables behind it is not necessary). Understands connection management / transaction participation, etc. - see below. The full .Save() type of functionality for single records, isolated collections and complete object graphs. Support some of the nice features of CodeXFramework V1.0 including the option to bulk insert added rows, etc. Should be able to work with "generic data". A fair example is a DataTable - but we can offer lighter options (both in code simplicity and with performance). Entities could come from third-parties or external libraries. This means you have no way to change modifiers, decorate them with ORM attributes, change inheritance, etc. - we should be able to leverage services like persistence, even with these. The life-time of services may not be a simple "using block" - e.g. UI services could last for the life of a form - give control to the developer with options. Plus, connection management should be split into a different service since sometimes this needs to be managed independently (i.e. multiple connections in a single service scope, or crossing service scopes). Detection of changes should be easy and allow UI's to be informed about dirty state changes. Building on this concept, we can create sophisticated framework layers that offer services not offered by many other frameworks. The "extra layer" is something I've exploited very successfully in the past - it's an interception layer that's at least "there". The layer is trivial to generate for CRUD, so difficulty is hard to justify (you would normally only write custom retrievals which can stand to have optimization that's easier centralized within procedures anyhow). The layer can value-add - optimistic concurrency, audit, etc. - controlled via declarative settings. There are some interesting optimization opportunities: native compiled procs, for example. Combine that with in-memory tables where it makes sense, and - just wow. The layer can support non-tabular entities - e.g. flattened procedures that interact with multiple tables, or cross-db situations, etc. This is just one flavor of database access - the provider interface means it'd be possible to integrate other ways, perhaps even a LINQ to SQL layer (a roadmap item). As of 0.2, CEF only supports MS SQL. As a rule, the framework will trade higher memory use for better performance. We do have some data structures that can appear to hog memory, but I've taken the time to ensure that when service scopes are disposed, memory is released as expected. Benchmarking also shows a linear performance characteristic, whereas EF is non-linear. Expect fewer "sanity checks" than you might get out of some ORM's - again, favoring performance heavily. As one example, we're going to trust you to do things like enable MultipleActiveResultSets on your connections when doing parallel operations (although in this example, we do check for this for some internal parallel operations). Again, the "micro" means light-weight, within reason. Registration process should support multiple code gens - for example you could generate 3 different registration methods for 3 different databases. All of the setup code we see should be generated from models: be it a database, or even an ERD. The end goal is you identify some logical model you want to work with, map it (visually, ideally), and then plumbing is created for you - start using objects and away you go. Sensitive to your preferences: for example, if your standard is to use integer primary keys versus longs, we should let you do that easily. The same is true with your naming conventions (although name mapping is more of a vnext feature). Ability to interop with DataTable/DataView. This is not my suggested approach, but given the familiarity many have with these, we can offer some useful extension methods to offer copying, merging, etc. I'll dive deeper on the various design goals in blog postings. The concept of a context isn't unfamiliar to many ORM frameworks. CodexMicroORM also uses the idea of a context, but is called the service scope. A service scope is unobtrusive: it doesn't need to be generated or shaped in a particular way - it can have any object added to it, becoming "tracked." The key is flexibility: you can mix-and-match approaches even within a single app! In fact, our demo app does this by using a Person POCO, along with a PersonWrapped wrapper (theoretically code generated). The Phone POCO does not have a corresponding PhoneWrapper, but that's okay - we don't need it since the infrastructure wrapper used will be provisioned with more services than it would be if you had a wrapper (or POCO) that say implemented INotifyPropertyChanged. In release 0.2, the main way to interact with the database is using stored procedures. As mentioned in the design goals, this is largely intentional, but it is just one way to implement data access, which is done using a provider model. Use of stored procedures as the "data layer" is by convention: you would typically name your procedures up_[ClassName]_i (for insert), up_[ClassName]_u (for update), up_[ClassName]_d (for delete), up_[ClassName]_ByKey (retrieve by primary key). (The naming structure can be overridden based on your preferences.) Beyond CRUD, you can craft your own retrieval procedures that may map to existing class layouts - or identify completely new formats. The sample app and test cases are good places to start in understanding what's possible! In terms of the SQL to support these examples: a .sql script is included in both the test and demo projects. This script will create a new database called CodexMicroORMTest that includes all the necessary schema objects to support the examples. You may need to adjust the DB_SERVER constant to match your own SQL Server instance name. The SQL that's included is a combination of hand-written stored procedures and code generated objects, including procedures (CRUD) and triggers. The code generator I've used is XS Tool Suite, but you can use whatever tool you like. The generated SQL is based on declarative settings that identify: a) what type of optimistic concurrency you need (if any), b) what kind of audit history you need (if any). Of note, the audit history template used here has an advantage over temporal tables found in SQL 2016: you can identify who deleted records, which (unfortunately) can be quite useful! CodexMicroORM plays well with the data layer, providing support for LastUpdatedBy, LastUpdatedDate, and IsDeleted (logical delete) fields in the database. Update: I've published a blog article that gets into detail on this topic of SQL data auditing. Update: deeper tool support has arrived with XS Tool Suite 2018 Volume 1. This version includes templates that can generate your business object layer (with settings via attributes), do your SQL data audit + CRUD procedures, and more! 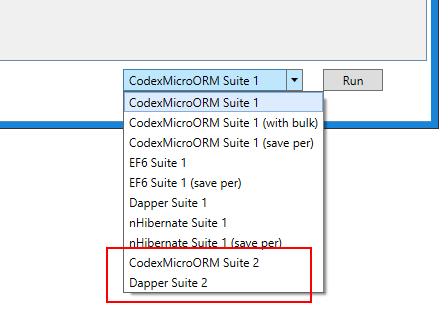 In release 0.2.1, I've enhanced the WPF demo to include a benchmark suite that tests CodexMicroORM, Entity Framework, nHibernate and Dapper. I selected these other frameworks on the expectation that they've "worked out the kinks" and we should be able to judge both performance and maintainability (code size). The methodology for testing is to construct two types of test (benchmarks 1 and 2) that can be replicated in all four frameworks. Benchmark 1 involves creating new records over multiple parent-child relationships. Benchmark 2 involves loading a set of people based on some criteria, updating them and saving them (and in some cases, their Phone data). Frameworks that don't keep their performance characteristic steady when increasing the data set size are non-linear - performance is worse than O(n). The higher the character count, the more code that was needed - a logical assumption is the complexity is higher and the maintainability is lower. Raw performance data is available here. The biggest concern I have with the EF results is that they're non-linear. Compare performance per row between the 3000 and 6000 row cases: the 6000 row case has nearly doubled the per row time, regardless of approach! This is not a good story for scalability. The EF appologist might say: "you shouldn't be using it in the way you're testing it here - it's not intended for that, use a different choice like Dapper if you need extreme performance or are dealing with many rows." I'd respond by saying the purpose of the comparison is to see if there does exist a general-purpose ORM framework that has linear performance in what amounts to randomly selected scenarios. Dapper succeeds (but as I discuss below, it has its own down-sides), and so does CodexMicroORM - but both EF and nHibernate fail the test in at least one scenario. I'm willing to be told "but you could have done things differently with framework X and it would have given much better results" - but again, the most obvious approach should be measured since if we require "deep knowledge" of the framework, chances are good we'll be cutting "bad code" for a while, until we've learned its ins-and-outs. If we could achieve good results with intuition, that would be ideal, of course. Generally speaking, EF is not thread-safe and trying to introduce Parallel operations resulted in various errors such as "The underlying provider failed on Open" and "Object reference not set to an instance of an object", deep within the framework. There was also an example of needing some "black box knowledge" where I had to apply a .ToList() on an enumerator, otherwise it would result in an obscure error. I'm not a fan of this "it doesn't just work," although we could argue it's a minor inconvenience and most frameworks have some level of "black magic" required. 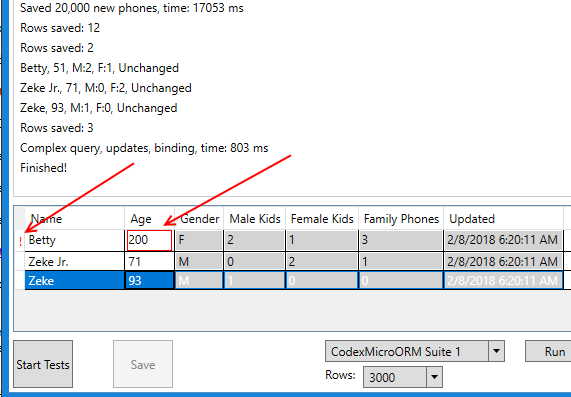 We might give extra marks to EF6 in its ability to properly interpret our LINQ expression in Benchmark 2 and thereby avoid use of the general-purpose stored procedure, up_Person_SummaryForParents. However, we might not always be so lucky: using procedures will make sense in situations where we need to use temp tables or use other SQL coding constructs to squeeze out good performance. It might surprise you that I'm not opposed to using EF to get nice advantages such as lazy loading. CEF is light-weight and can interop with really any other framework since it's simply about wrappers and services for existing objects. So imagine being able to helicopter-drop it in (as easy as adding a NuGet package!) to solve problems where other frameworks start to feel pain: that's supported today. Let's face it: nHibernate must deal in stylized objects, not necessarily true POCO that might pre-exist in your apps. The clearest evidence is the fact all properties must be virtual - you may or may not have implemented your existing POCO's with that trait. The counter-argument could be "but you're requiring CEF objects expose collections using interfaces such as ICollection instead of concrete types." My counter-counter argument would be, "there's no strict requirement here - but you do lose some framework 'goodness' and may need to do more 'work' to get your desired results," and "it's a common and generally good design pattern to expose things like collections using interfaces so you can hide the implementation details." Something you might notice in the code is the nHibernate solution includes quite a bit of set-up code. I chose to use the Fluent nHibernate API, but the XML approach would have resulted in quite a bit of configuration as well. I also spent a bit of time trying to understand the ins-and-outs of the correct way to do the self-referencing relationship on Person, and borrowed the generated EF classes which match the database structure completely. On the performance side, nHibernate scales linearly with the "save existing object model" scenario - but it does not for the "save per parent entity" case. (This would also match a case where we chose to use database transactions to commit per parent entity.) Like EF, parallelism was not kind to nHibernate and I had to avoid it generally. Another minor consideration is the fact as of today (12/31/17), nHibernate does not support NetStandard 2.0. It became evident as I tried to implement the Dapper solution that it's not really the same style or purpose as the other ORM tools. I'd call it more of a "data access helper library" instead. Unlike the other frameworks tested, it does not track row state: it's up to you as the developer to know when to apply insert, update or delete operations against the database. This helps it achieve its excellent performance, but it's just a thin wrapper for raw ADO.Net calls. Because of this, I didn't attempt a "populate and save all" version of tests for Dapper: it only really made sense to do the "save per parent entity" method. If we constructed a way to do a generalized "save" using Dapper, chances are good we'd lose the extreme performance benefits since we'd be applying the principles that make other frameworks slower. Dapper although the clear winner on performance was the clear loser on code size / maintainability. Anecdotally, I also had more run-time errors to debug than other framework examples since there's no strong typing. Similarly, changes in the database schema are more likely to cause run-time errors for the same reason: no strong typing we could tie back to code generation. (Although I'm sure if I looked hard enough, someone has created templates to act as wrappers for database objects.) This in turn speaks to its nature, much as EF and nHibernate, being more highly-coupled with your database than you might want to believe (e.g. requiring ID's to support relationships, etc.). CEF offers linear performance results and has among the smallest, most succinct code implementations. It's worth noting that you can use EF-generated classes, if you like, with CEF. I did an extra test for CEF that I did not include for other frameworks - because it's somewhat unique to CEF out-of-the-box - the ability to save added data using BULK INSERT. 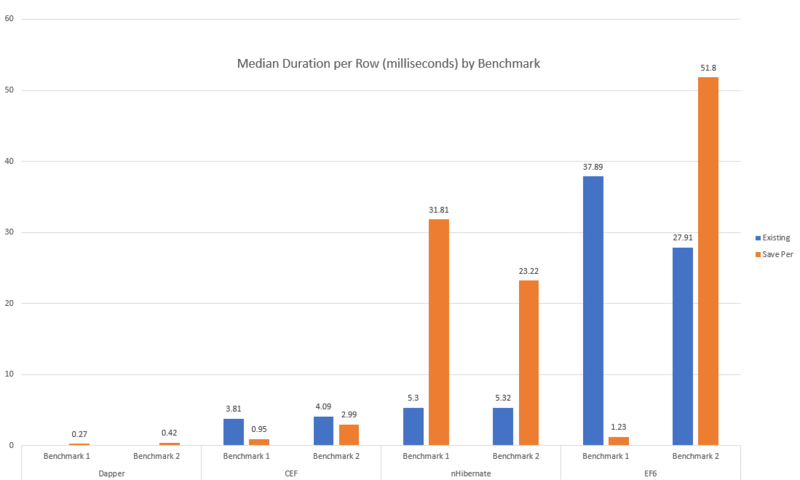 That case for Benchmark 1 yielded a median time of 0.9 ms/row (both 3000 and 6000 row runs). This is the fastest way to "save an existing, full object graph" among all tests. The trade-off? You don't get PhoneID's assigned in memory at the end of saving. Am I claiming that CEF is "perfect"? Certainly not: this is version 0.2.1 - but I'm quite confident it's positioned well to offer O(n) performance based on data set size. If you discover something slow, let me know! The orange line is allocated memory - within the context of the red box, this is where a collect had been issued and the orange line has dropped to near-zero. The Type Details shows us what's the largest "left over" allocated objects: mainly ADO.Net static data that we have no control over. Entity Framework and nHibernate forced me to adopt class structures that match the database more closely than my original POCO's do. For example, my "Phone" POCO has no PhoneID, nor should it really require it from an object model perspective: it's a storage construct (an important one, yes, but strictly speaking, it should not be forced on our object model, if we don't want it). 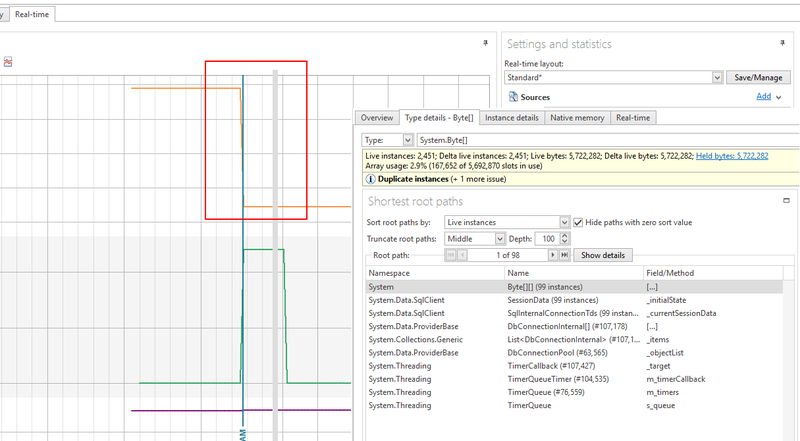 Entity Framework and nHibernate both had at least one non-linear performance scenario. Dapper, although very fast, provided the most verbose implementation by a factor of 2x-3x. None of the frameworks tested (other than CodexMicroORM) natively understand the concept of "last updated by", "last updated date" fields as standardized audit fields. This results in more repetitive code. The pattern of "saving while populating" seems to work better than "save everything at the end" with some frameworks - but this may or may not align with your needs in each situation. For example, you may be populating an object model, passing it around, and saving it after some additional work - this would not align with "save as populate" and if we're looking for the best generalized solution, ideally it balances performance while offering different options to solve your problems. The Dapper implementation uses the same stored procedures that the CEF example uses to help be more apples-to-apples. Doing the Execute() with in-line use of parent.ParentPersonID and parent.Gender results in run-time errors, and the simplest, most desirable approach of simply using "parent" as the second parameter does not work, either. 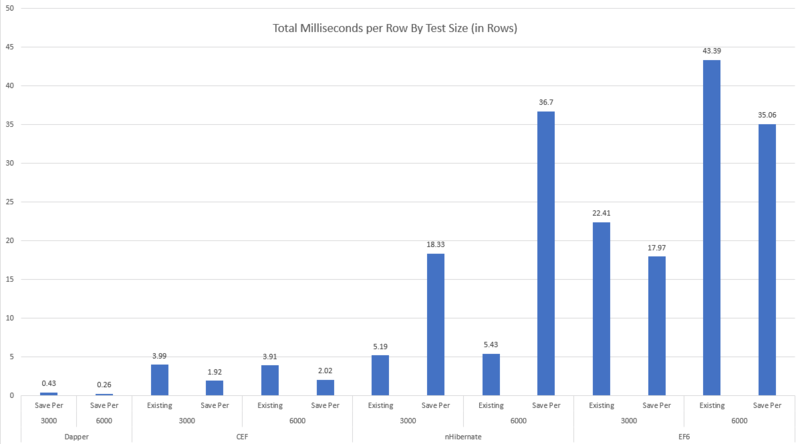 The final performance result is that Dapper's per-database-call timing averages 0.47 milliseconds, whereas CEF is 0.34 milliseconds - nearly 30% faster than Dapper. 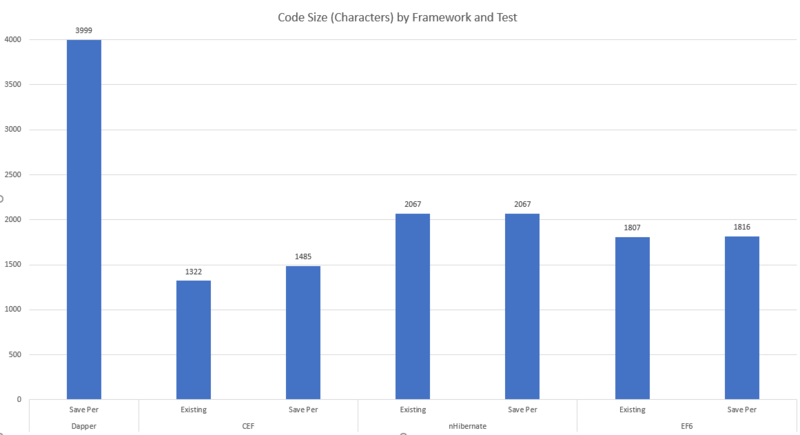 In terms of code size, CEF's implementation is 1618 characters compared to Dapper's 2629 characters - meaning CEF in this example offers a 30% performance gain with nearly 40% less code to write and maintain! Now, there are ways to achieve similar results using Dapper - by writing even more code. CEF's implementation of async saving leverages a combination of in-memory caching and parallel operations that we can synchronize on as needed. (In fact, leaving your current connection or service scope ensures all outstanding async operations will be complete.) The use of the new MemoryFileSystemBacked caching service is something I'll cover in a future blog post, but in this particular benchmark, async saving was the clear way to "win" against Dapper. It's also worth noting that with 0.2.3, some of the performance figures were lowered due to performance tweaks - but in 0.2.4, we gave back some performance with the addition of important new features. These types of changes will happen natually and I'm not going to redo performance comparisons after every release. (I didn't do a perfect job when evaluating the other frameworks, too, giving them a pass in some respects - e.g. did not round-trip all values, which would have increased the code size in cases). Some may say, "benchmarks can be made to prove anything you want" - which is true, but quantitative analysis offers at least something objective, where measuring things like "features and style" is much more personal. Suffice it to say that offering great performance and advanced services is a goal and look for more goodies in up-coming releases! I suggest doing a clone to grab the full code base. The test project has a number of important use cases, illustrating capability. 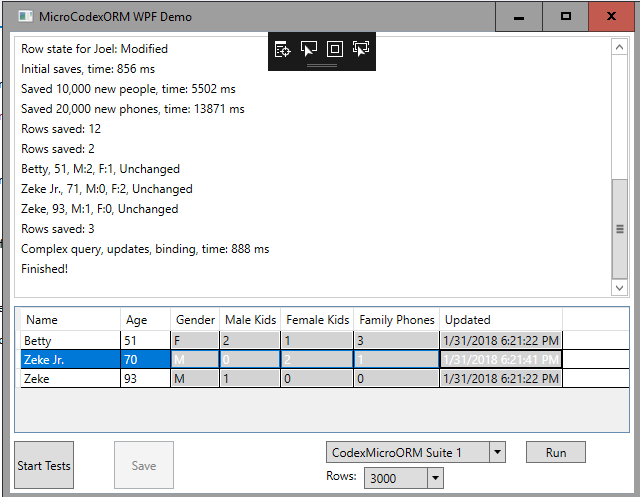 The WPF demo project includes performance benchmarking, but also shows general concepts, contrasts patterns with other frameworks, and illustrates live WPF data binding. You can include CEF in your own projects using NuGet: NuGet - Core, Nuget - Bindings. I'll be providing further updates both here and on my site. Registering on xskrape.com has the added benefit of getting you email notifications when I release new blog articles that provide deep dives into the concepts you see here. On-line documentation will become available, with your feedback and encouragement. In the meantime, many of the concepts will be covered through blog articles. Also, click "Watch" above to keep track of updates made here on GitHub. Want to see even more? Share, watch, clone, blog, post links to this project - and mention it to your friends! Contribution and development is proportional to community interest! This framework will be a drop-in replacement for my "old" framework in many projects (templates to come), so will receive increasing production attention. Added support for "Shadow property values" - this is more of an advanced topic where we can leverage these to avoid updating your POCO objects with "system-assigned temporary keys" yet still retain identity like we do in earlier releases. In short, you might not care about this a lot but there could be some interesting "other applications." Async saving - easily enabled for situations that do not require immediate round-tripping of values assigned by the database, offers significant performance benefits (see above for some tangible benchmarks). Caching - default caching service is MemoryFileSystemBacked; offers performance benefits in a number of scenarios including mitigating slow connections. New illustrative test: MemFileCacheRetrieves. More examples will be made available in future articles. internal refactoring - removal of many static methods used in services in favor of interfaces that enable full "pluggability" for anyone wanting to write their own replacement service. Fixes related to serialization, async save, etc. Internal refactoring to improve memory footprint and performance - SIGNIFICANT! - What's new in 0.5? Come and subscribe to blog updates. Have opinions about what you'd like to see? Drop me a line @ joelc@codexframework.com. Pull requests are welcome, too.